Couple of weeks ago some Black Ops beta ads were found on Bing (search engine) and now similar ads have started to appear on Google as well. The multiplayer beta test hasn’t been officially announced yet, but based on the new ads on Google, it’s not that far away: "Sign up for the exclusive Xbox 360 multiplayer beta on September 1." This should be taken with a bucket of salt! The beta is supposedly only on Xbox 360, which shouldn't surprise anyone, considering the fact that all future Call of Duty add-ons will launch first on the Xbox 360. The deal between Activision and Microsoft will last until 2012 and should include beta tests as well. Treyarch's previous game, Call of Duty: World at War, had a beta test and every big release these days has one, just look at Halo: Reach, Battlefield: Bad Company 2 and the dozens of games before them. The URL in the ad has been used in the World at War beta, but it's currently redirecting visitors to the Call of Duty homepage. It's also been known for a while that the user registration page at the official website hints at a possible beta for members: "First-in-the-world access to REDACTED -- you are not yet cleared for this information." Stay tuned for the full multiplayer reveal on 1st of September. We might learn more about the beta test at the end of the trailer, but don't get your hopes up. EDIT: Josh Olin, Treyarch's community manager, has now confirmed that these ads are not official. 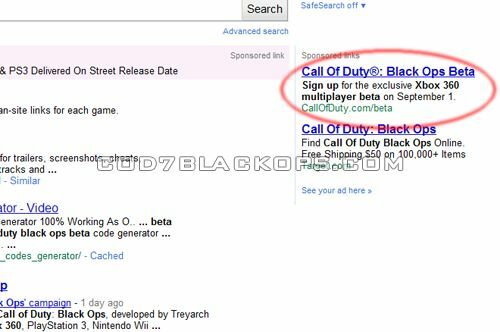 "Bing / Google / ads for a #CODBlackOps BETA are not official ads. As always, if I don't say it, it's not official!"